Underwater photography might be seen as a highly-specialized form of photography, but many of the marketing and business principles we can learn from it also apply to many other genres. For example, when I started my own portrait and wedding photography business after spending 4 years photographing divers and creating videos of their SCUBA diving adventures, I discovered that many of the skills I’d learned underwater, such as having to think on my feet and make swift decisions to find the perfect angle for a photograph, were a great help in wedding photography. Not only that, but underwater photography has the power to show people who have never experienced the marine environment for themselves the wonders of that amazing world, and helps educate people on the value of conserving it for future generations. I was thrilled to sit down with amazing underwater photographer Christine Shepard to talk about her exciting life photographing sharks and how she works hard to help both the science and conservation of our precious marine resources. 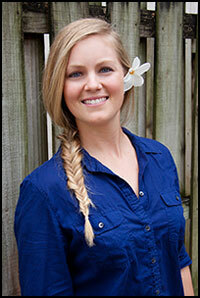 Today, I have nature and wildlife photographer Christine Shepard here with me from Miami, Florida. Christine is recognized as one of the world’s most promising young wildlife photographers. Her raw creative talent, vibrantly optimistic attitude, and formative years of experience working alongside leading marine scientists make her a sought-after professional. From 2010 to 2014, Christine served as the Media and Virtual Learning Manager for the University of Miami’s Shark Research Program, helping to build the program into a world leader for experiential education and citizen science in marine conservation. She translated the scientific findings of her colleagues into visually engaging multimedia packages for the public, primarily through photography, video abstracts, interactive websites, online and printed educational materials, and social media. 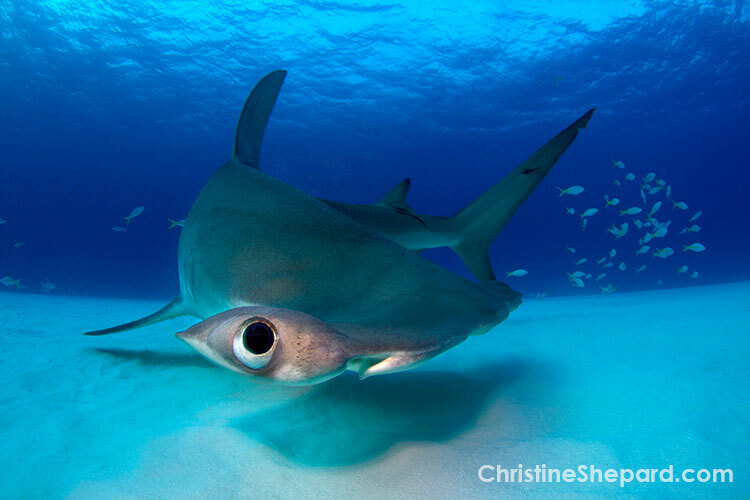 Christine was recently a “Highly Honored Winner” in Nature’s Best Photography Windland Smith Rice International Competition for her captivating image of a Great Hammerhead shark, which will be exhibited at the Smithsonian Natural History Museum in Washington, D.C. from October 2014 – October 2015. She was also a finalist in two categories of the 2014 BBC’s Wildlife Photographer of the Year. She has worked with the Discovery Channel’s Daily Planet science news show to share her enthusiasm and passion for the oceans, hosting multiple educational segments for Shark Week., and she’s been personally featured in Oprah’s O Magazine as a role model for young women to live their best life. The award-winning third edition of ‘The Underwater Photographer’ dragged the topic kicking and screaming in to the digital age and with the fully-updated fourth edition highly respected photographer and tutor Martin Edge takes you deeper in to the world of Underwater Photography. Practical examples take you step-by-step through the basic techniques from photographing shipwrecks, divers, marine life and abstract images to taking photographs at night. Brand new chapters cover not only highly specialist underwater photography techniques such as low visibility/greenwater photography, but also the digital workflow needed to handle your images using the latest software such as Lightroom. 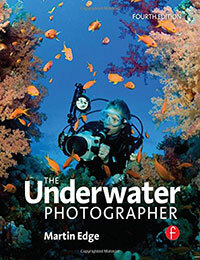 Packed with breathtaking images and an easy-to-read style honed from over twenty years of diving photography courses, this book is sure to both educate and inspire underwater photographers of all skill levels.